South elevation of the Arts & Industries Building. The Arts and Industries Building was constructed between 1879 and 1881 to the architectural design of Adolph Cluss and Paul Schulze, two German-born architects. It sits east and south of the Smithsonian Institution Building, commonly known as the "Castle," on the National Mall. The building was originally the National Museum, which opened to the public in 1881. It is generally Romanesque Revival in style, but its classical floor plan and elaborate elevations exhibit a balance of different stylistic influences. The square building plan consists of a Greek cross of four two-story Halls that open into a soaring central Rotunda. Arcades of rounded arches on piers divide the Halls from four flanking Courts and eight Ranges to create a vast, visually open space. 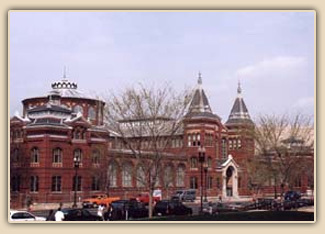 The Arts and Industries Building now houses a number of Smithsonian Institution offices, the Smithsonian Institution Archives and temporary exhibition space. It is currently undergoing an extensive renovation and restoration. The project architect, Polshek, Tobey + Davis, contracted with Welsh Color & Conservation, Inc. to perform an analysis of the historic interior paints and finishes. This ca. 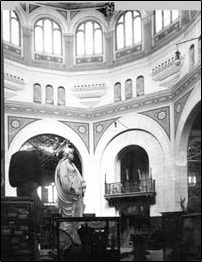 1900-1902 photograph of the Rotunda illustrates six original 1881 painted patterns on the walls, extending all the way up to the ceiling. 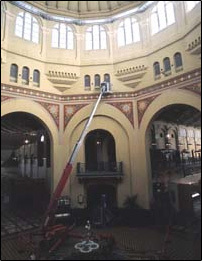 Welsh Color & Conservation, Inc. used this 80-foot lift to expose the original 1881 decorative painting in the central Rotunda. The paint and decorative patterns in this view date from a 1970s-era partial restoration. Our company's role in this restoration process was to investigate, identify and document the original 1881 architectural and decorative finishes in the major public spaces of the building: the Rotunda, Halls, Courts and selected Ranges. To initiate our study, we did extensive documentary research in the Archives, aided by the Office of Historic Preservation. Numerous historic photographs of the building's 1881 decorative scheme were scrutinized for details. The photo documentation yielded valuable information, especially about the placement and nature of the original decorative patterns painted on the upper walls. The photographic record was essential to the development of our overall investigative plan. In the spring of 2001, a team of three experts from Welsh Color & Conservation, Inc. spent six weeks on-site investigating and documenting the building's original interior finishes. We set up a temporary lab space in the building for initial microscopical inspections and organization of the 170 samples that we collected. To determine the non-decorative architectural paint finishes on wood, metal and plaster, we sampled small areas of each representative feature. Investigating the decorative painting was more challenging. Although much of the 1881 decorative painting survived in the Halls, Courts and Rotunda, it had been overpainted many times. A partial restoration done in the 1970s that is still seen on the walls approximated the original decorative patterns but is inexact and incomplete. We worked from one- and two-man lifts to expose and accurately record each original pattern. All later paint layers were manually removed to reveal large sections of the 1881 decorative painting. The patterns revealed in these exposures were traced onto clear acetate sheets. Often, many partial exposures were necessary in order to complete the entire design. 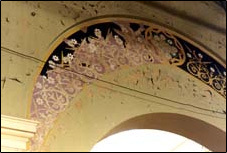 The large scale of the decoration made this tracing process difficult; for example, the arch pattern in the Halls (pictured below) is over 24 feet wide. Paint color samples were also collected from the original patterns for evaluation of original color and appearance. Partially exposed original pattern over the main arch in the West Hall. All of the 1881 patterns were painted in calcimine. Lavender and yellow were the colors used most frequently. The dark blue pattern surrounding the exposure dates to the 1970s. 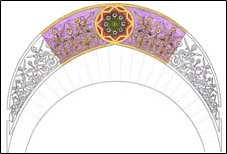 Colored rendering of the original arch pattern as presented in our report. Overall, the original decorative scheme in the building's major public spaces augmented its open, airy structure. The plaster walls were largely unpainted. They were sand-finished, scored and penciled to imitate the appearance of laid stone blocks. All original paints used on plaster on the building's interior, including and especially the decorative painting, were calcimines - water-based, glue-bound, calcium carbonate paints. The ten original decorative patterns were hand-painted and stenciled onto the upper walls. The patterns are artistically elaborate, featuring geometric and organic designs. Some elements were painted in trompe l'oeil to create an illusion of depth. The decorative color palette is rich and varied, dominated by bold lavenders and strong yellows and augmented by a range of bright and muted tones. Our polarized light microscopical analysis revealed that the pigments most frequently used in the calcimine paints were calcium carbonate, ultramarine blue, red iron oxide, yellow ocher and carbon black. Interestingly, many colors and designs in the 1881 decorative patterns are echoed in other original building features - decorated colored windows, cast iron elements, etc. - indicating a cohesive overall decorative scheme. Our participation in this project lasted for one year from start to finish. We compiled the results of our investigation in a 130-page report. An illustrated narrative describes the 1881 decorative scheme, and color palette tables identify 68 original interior colors in the major public spaces and selected offices. Detailed pattern drawings created from our tracings present the designs and color placement of the ten decorative patterns. Laboratory data record the results of our stereomicroscopical and polarized light microscopical analysis of the paint samples. Photomicrographs illustrate the paint layer structures of several key samples as well as the pigments used to make them. Our report, pattern drawings and color samples are designed for ease of use by the client and selected decorative painter to accurately restore the Arts & Industries Building's original interior decorative scheme.